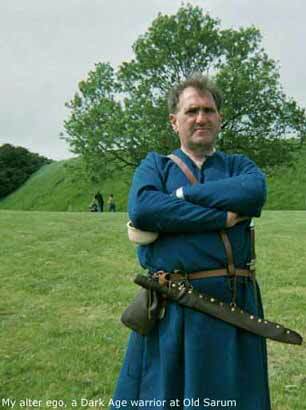 Edwin's alter ego, a Dark Age warrior at Old Sarum. He had friends amongst both Celt and Saxon. We dont know which side of Wansdyke he would have stood or what he called it. Whatever his race, this was his land. He and his kin walk with us along the Wansdyke. 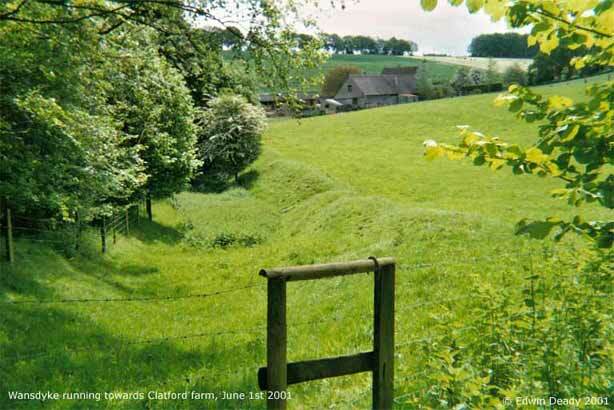 Of Wansdyke was where it came near the entrance track after crossing the fields from Shaw House and passing the northern edge of the deserted medieval village of Shaw, to which there is permissive access. The day was overcast as I entered West Woods but it was lightened by the bluebell sheen spread across the leafy brown of forest floor. Walked carefully along and down the track that was cut about by forestry vehicles with deep puddles in some of the ruts. There is considerable animal burrowing into the bank, probably rabbits and badgers. From the material ejected by their excavations it is possible to guess at the material in the bank. Examination of animal spoil heaps in a systematic way might be useful for possible dating and provenance evidence. Wansdyke west of the Lockeridge Alton Barnes Road, looking north. Wansdyke west of the Lockeridge Alton Barnes Road, looking south. 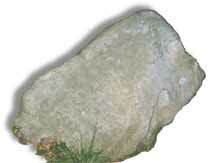 The chalk rubble appears be from about � to 2 cubic inches in size. And if this is the size used by the original builders then we can imagine a different technique to the earlier earthwork builders of the region who appear to have levered out blocks rather than breaking the chalk down to pieces small enough to shovel as at Silbury Hill, for example. Chalk rubble predominates for the section before the crossing of the road to Clatford farm. Clay With Flints seems to be the bank material for the section between the Clatford farm road and the Marlborough-Pewsey Road. In this last section there are also a number of Sarsen Stones but it is not possible to see if they were used as a revetment or as a core to the bank. This last section past Short Oak Copse and onto the Marlborough Pewsey Road is very damaged with deep pits in both bank and ditch. 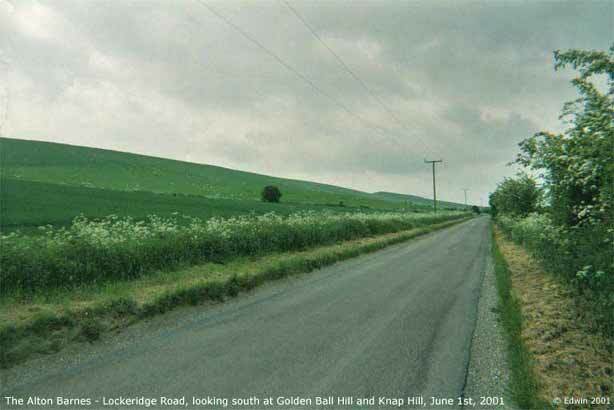 The Lockeridge - Alton Barnes road, looking south to Golden Ball Hill and Tan Hill. Mud is natural to the Wiltshire walker and would have been so for the builders of Wansdyke. If they were digging chalk and it rained then every exposed surface of chalk would have developed a thin cream film and as they tried to walk on a steep chalk path there would have been many falls, especially if carrying loads of rubble and trying to keep to an overlords schedule. If they were digging clay or clay with flints then everything would have gone the same orangey mud colour, cuts from sharp broken flints would have stung more in the cold and the wet. Every attempt to dig the clay would give a miserable shovel load as loosened clay packed down again at each slide of the shovel. Of course, Wansdyke may have been built almost as a festival activity in warm sunshine with comely maidens plying the diggers with thirst quenching ale. Grim strategic necessity suggests the wet scenario. 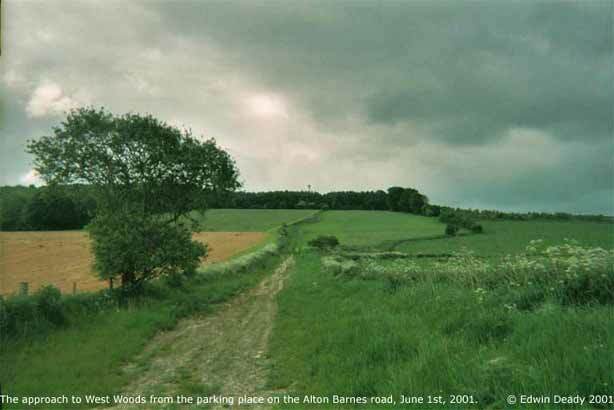 The approach to West Woods from the parking place on the Alton Barnes road. When one sees again Wansdyke the question as to its function follows the pleasure in renewing its acquaintance. It is obviously an obstacle and one that is meant to make a statement. Any linear earthwork can be stormed because the attacker can concentrate where he will and the defender must be prepared to defend anywhere. Its construction is certainly in both the Roman and the Germanic tradition of linear defences, and may have been in the Celtic as Caesar found, with banks used in combination with woods. As a passive defence it is not likely to have been much more than a strong expression of territoriality, a factor in wrong-footing an invader, but not likely to have made a huge difference. If patrolled, it offered a patrol line with clear views and had an instant defensive application but one that could be easily outflanked. If there was still a tradition of carrying stakes and entrenching tools a section of Wansdyke could have been cut off and defended quite adequately. A parallel to this is the sections of trench fortified in extremis in the First World War. First view of the Wansdyke from the Woods. 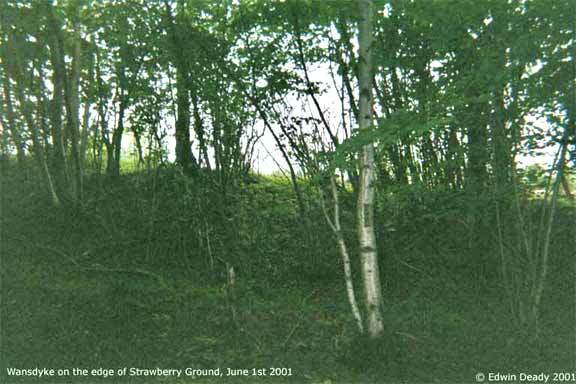 On the edge of Strawberry Ground. If strongly patrolled and part of a real defence structure then it had to be in support of an active defence policy that had an offensive potential. The Roman Wall to the far North offers a possible model. As might the area from the A4 road at the Cherhill Black Horse Inn across the Downs and Oldbury Camp hill fort to where Wansdyke seals the area behind and which may be a section an the active policy can almost be seen in operation, especially if there is any credence whatever in the theory expounded by S G Wildman in his book " The Black Horsemen" (John Baker, London, 1971, isbn 0212983881) that there may be some connection between sub-Roman (Arthurian) military cavalry stations and some of the Inns called "The Black Horse". Cavalry securely housed in a refurbished hill fort, communication to their rear and a route for back up. Standing in a wide break on Wansdyke looking northeast. 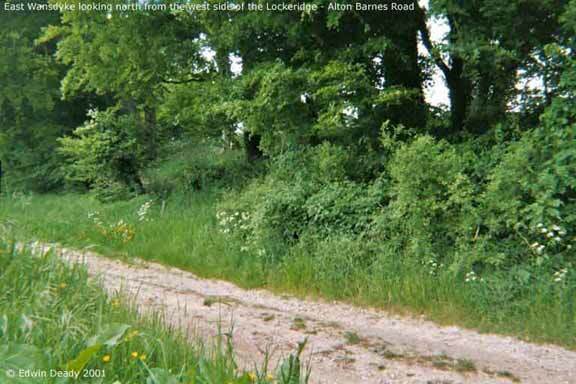 The ditch and its lip to the northern side of Wansdyke appeared to be in good condition wherever Wansdyke itself was visible. 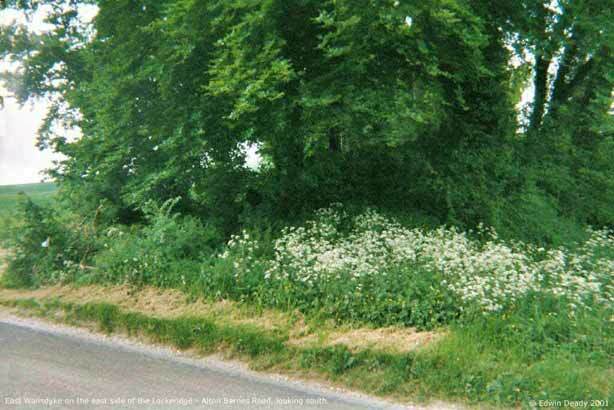 The first section of Wansdyke had either been ploughed down or eroded to be almost level with the fields behind it, however it may not have needed to be very high when there was a natural drop to its ditch side. It may be significant that if the bank has been eroded it has not been pushed into the ditch and so may not have been high in the first place. 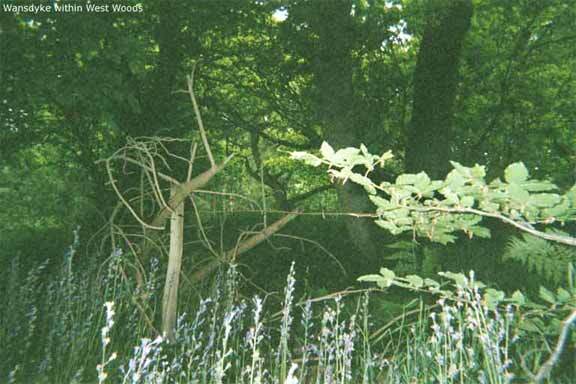 Vegetation was mainly regrown coppiced hazel and oak with bluebells, wild garlic, ferns, brambles and nettles. Forestry Enterprises leaves cut down hazel and other wood debris to rot on the bank, which does hamper movement and prevents a clear view of its outline it is not easy to walk along the top of the bank. Animal life observed was one hawk-like bird, rabbits, a walker doing a circular pub walk and numerous deer tracks, which were probably Fallow Deer although none were seen. Gaps are of different forms and, obviously function; they should be plotted and investigated either by excavation, bore sampling or non-intrusive geophysical methods. The dating and mapping of gaps should be useful in hypothesising on the strategic structure of the Wansdyke system. Into the daylight again, looking towards Clatford Farm. 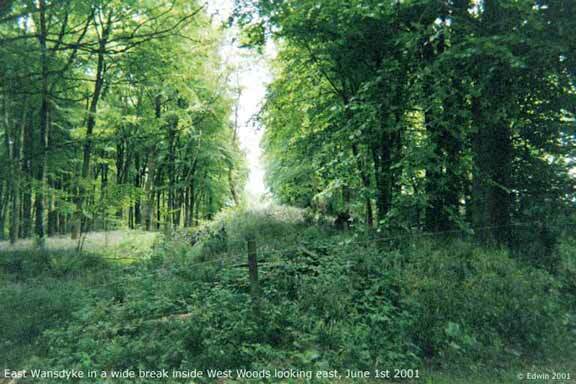 A Visit to Wansdyke - West Woods is Copyright � 2001, Edwin Deady. All rights reserved. Used with permission.